$51,901.00 This Belt Buckle was custom made for our client. We used approximately 10 Karats of Diamonds, 10.75 Karats of Rubies & 5 Karats of Sapphires to assemble this piece. 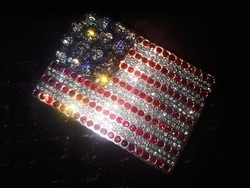 It is a unique one of a kind piece combining our Machine U.S.A. Buckle with our Catacomb Skulls Pave with Sapphires & Diamond Eyes for the Blue and White Stars. This buckle is .925 Solid Sterling Silver. Click on the images for a larger view. All pieces in the Soffer Ari collection are proudly Handmade in the U.S.A.